In a 12-part interview series conducted by Orlando NPR station WMFE in remembrance of the one-year anniversary of the Pulse Nightclub Shooting, Dr. Hector Adames and Dr. Nayeli Chavez, both of the Counseling Psychology Department, discuss the tragic event, race, culture, ethnicity and identity in the context of psychology. Dr. Chavez can be heard in part three, and Dr. Adames can be heard in parts three and four. Listen to the series. 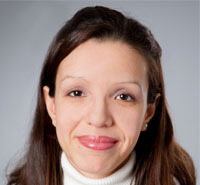 Nayeli Chavez, Ph.D. is a licensed clinical psychologist. She earned her Ph.D. in Clinical Psychology from Southern Illinois University at Carbondale. Dr. Chavez has significant experience working with immigrant, Latino/a and African American communities. She has provided clinical services to individuals and families referred by the Department of Children and Family Services. Read more. Hector Y. Adames, Psy.D. obtained his doctorate in clinical psychology from Wright State University in Ohio. He completed an internship in neuropsychology and a postdoctoral fellowship in neuropsychology at the Boston University School of Medicine and the Center for Translational Cognitive Neuroscience. He is licensed in both Illinois and New York, and is bilingual, providing clinical services in both English and Spanish. Read more.